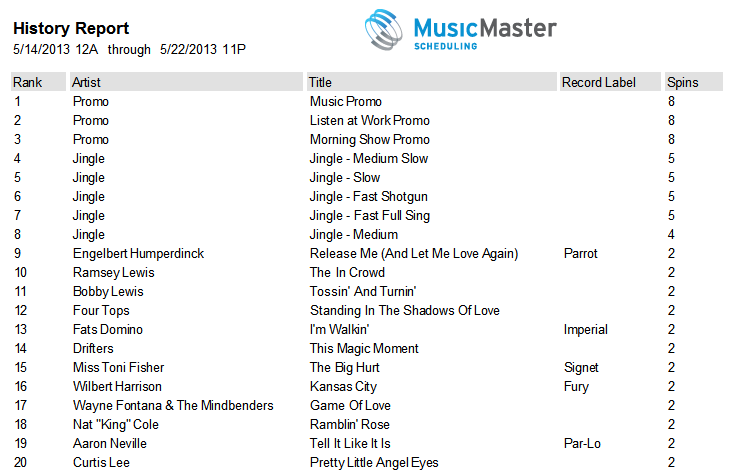 MusicMaster Spins Report | by Aaron Taylor – WELCOME TO OUR INTERNATIONAL SUPPORT! 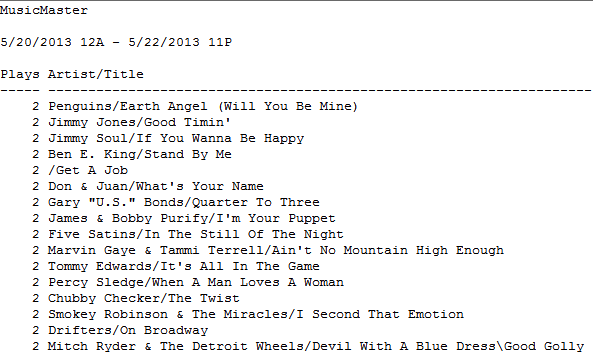 Whether it’s for your consultant, group program director, a record label or your own edification MusicMaster has a number of spins reports that are available for you to utilize. In this article, I will cover your choices and how to find them in the application, detail the options in each, and give you a sample view of the generated report. It is important that no matter what report format that you settle on, that you make certain to review the OPTIONS tab and the choices contained within for each. Each report highlighted here has slightly different configurations that are possible. Once you print the report for the first time, those configurations will be held for subsequent sessions with the report. There are no default settings that are preset. Since this is the first time you’ve likely run this report, select the Options tab. Fill in whatever Station Name you like in the first box (that’s optional) and decide whether you need Primary Rest Merge set to YES or No. This option would be used if you have previously set up a keyword field as the Primary Rest field in Tools, Options, Additional Properties. Setting this to “Yes” will combine all the plays of all the songs with the same primary rest keyword into a single entry. Details like Artist and Title will come from one of the combined songs. 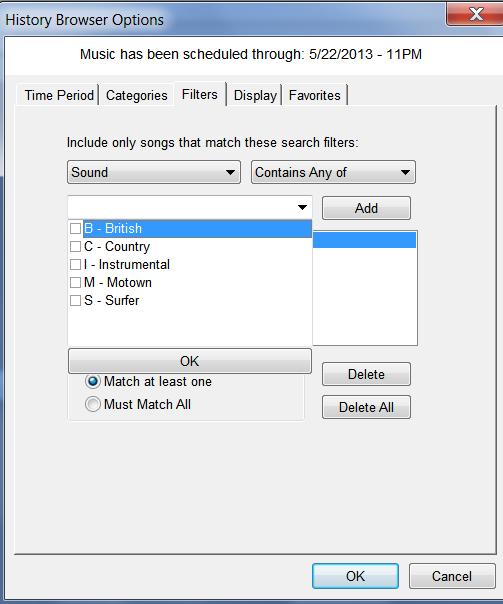 It is also important to note that if you are using History Linking / Alternate Category for some purpose other than multiple instances of the same song, then you will not want to activate this option. Unless you have specific other needs, we’ll suggest you set Maintain Print Width to “Yes”, and Data Format Set to “Report Style” as shown below. 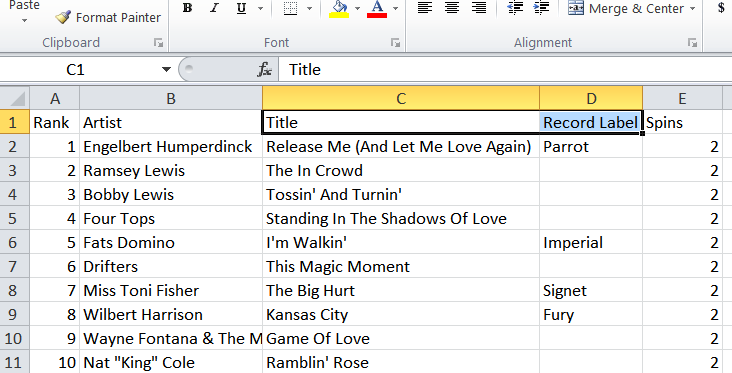 You have up to 10 user configurable Song Fields here you can utilize, just click in the white space to access the drop down menu of your field choices. Now, click back to Report Setup. Select the date and hour range you wish the report to span, and select categories you wish to include/not include in the report. You also have the option as to whether you wish to choose the report to generate a continuous or daily hour range. From here, decide if you would like to print this to paper or save as a file on your desktop or network. This report format gives you a decent amount of flexibility in which additional fields you like as part of the report, and doesn’t require much set up. 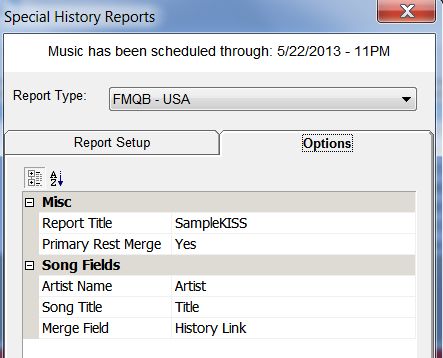 You need only to configure the “Artist Name” and “Song Title” fields to make this one work. If you wish to utilize the Primary Rest Merge functionality you can do so (as shown) by selecting Yes to activate that option, and selecting your Merge Field in the database. 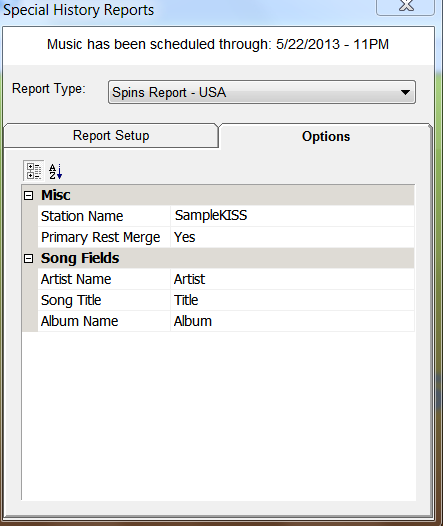 This is the simplest, easiest to configure spins report available. Perhaps you’ll decide to use this one as a basic internal audit tool. 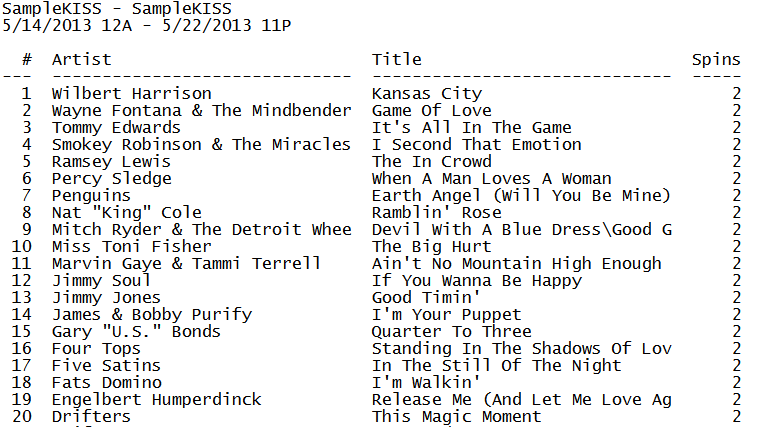 This one is basically the same as the FMQB report. The Options tab gives you the ability to pass through the Album field if desired. 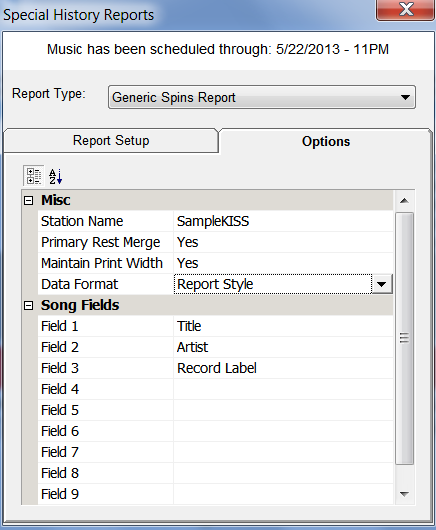 Also a simple to configure and basic report, however this one does not rank the list by spins as the one above does. This final choice has the most flexibility. Not only are you able to determine the categories to include in your report as well as the time period, but you will have a multitude of other configuration possibilities. 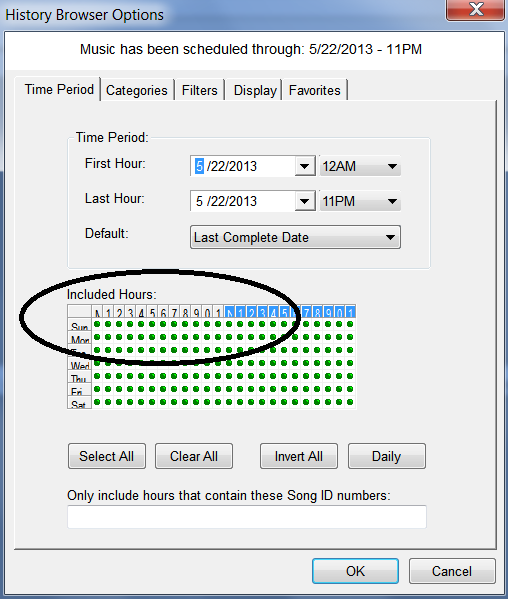 For example, the time period tab gives you the option of excluding certain hours or day parts if you wish from the report. You could also decide to generate a report that only includes specific songs. 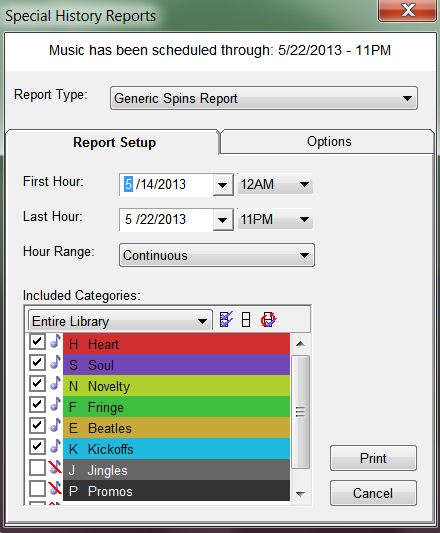 If needed, you may also decide to use the FILTER tab to exclude songs with certain attributes from the report. 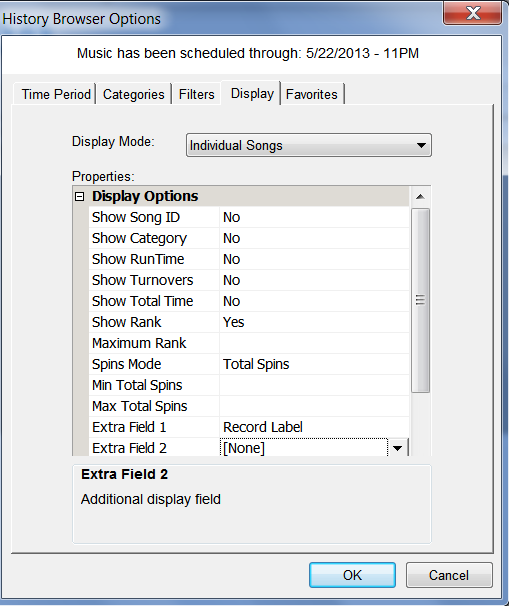 Finally, the DISPLAY mode you’ll want to set for SPINS will be “Individual Songs” Note the variety of Display Options available to the user. We’ve set these to our recommendations below for simplicity sake. Once you select OK, you’ll get a result that looks much like the example displayed below. This report can be copied to spreadsheet if so desired (by simply clicking CTRL-C to copy the contents and CTRL-V to paste the contents into your spreadsheet application. Or, click the print Icon in the upper right hand corner of the report viewer, to get a nicely formatted report.